Take out a one dollar bill. The bill you're looking at first came off the presses in 1957 in its present design. This so-called paper money is in fact a cotton and linen blend, with red and blue minute silk fibers running through it. It is actually material. We've all washed it without it falling apart. A special blend of ink is used, the contents we will never know. It is overprinted with symbols and then it is starched to make it water resistant and pressed to give it that nice crisp look. If you look on the front of the bill, you will see the United States Treasury Seal. On the top you will see the scales for a balanced budget. In the center you have a carpenter's square, a tool used for an even cut. Underneath is the Key to the United States Treasury. 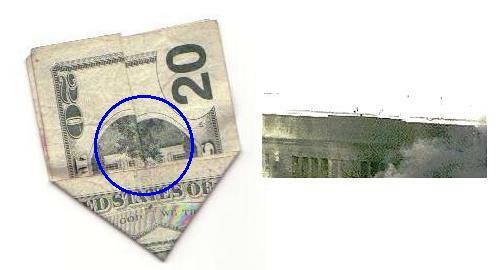 That's all pretty easy to figure out, but what is on the back of that dollar bill is something we should all know. If you look at the left-hand circle, you will see a Pyramid. Notice the face is lighted, and the western side is dark. This country was just beginning. We had not begun to explore the West or decided what we could do for Western Civilization. The Pyramid is un-capped, again signifying that we were not even close to being finished. Inside the capstone you have the all-seeing eye, an ancient symbol for divinity. It was Franklin's belief that one man couldn't do it alone, but a group of men, with the help of God, could do anything. Several years ago, a friend of mine and her husband were invited to spend the weekend at the husband's employer's home. My friend, Arlene, was nervous about the weekend. The boss was very wealthy, with a fine home on the water-way, and cars costing more than her house. The first day and evening went well, and Arlene was delighted to have this rare glimpse into how the very wealthy live. The husband's employer was quite generous as a host, and took them to the finest restaurants. Arlene knew she would never have the opportunity to indulge in this kind of extravagance again, so was enjoying herself immensely. As the three of them were about to enter an exclusive restaurant that evening, the boss was walking slightly ahead of Arlene and her husband. He stopped suddenly, looking down on the pavement for a long, silent moment. Arlene wondered if she was supposed to pass him. Still silent, the man reached down and picked up the penny. He held it up and smiled, then put it in his pocket as if he had found a great treasure. When I see a coin, I pray, I stop to see if my trust IS in God at that moment. I pick the coin up as a response to God; that I do trust in Him. For a short time, at least, I cherish it as if it were gold. I think it is God's way of starting a conversation with me. Lucky for me, God is patient and pennies are plentiful! When I was out shopping today, I found a penny on the sidewalk. I stopped and picked it up, and realized that I had been worrying and fretting in my mind about things I can not change. I read the words, "In God We Trust," and had to laugh. Yes, God, I get the message. It seems that I have been finding an inordinate number of pennies in the last few months, but then, pennies are plentiful! Read detailed history at The US Treasury Dept. We proudly support the men and women of our military serving abroad. We are thankful for their service and sacrifices that grant us the freedom we enjoy every day ― and often take for granted. We pray for a quick resolution so they all may safely return to their families. 1. 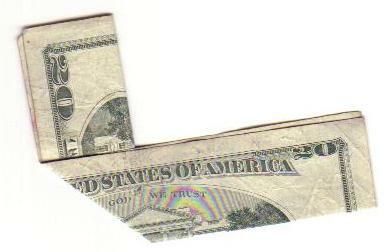 Fold a $20 bill in half so you see the top half of the back. 2. Fold the left half away from you. 3. Fold the right half over. There's the Pentagon! 4. 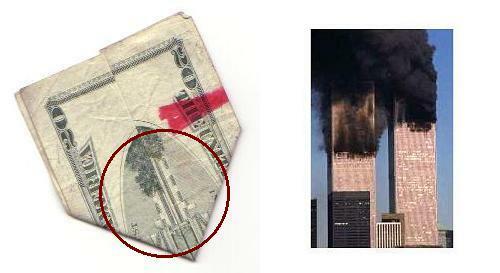 Flip the bill over to see the World Trade Center! Is it just a coincidence or something more? Software used for adding new data to Jerry's Memory Book often does not process your entry.